$65 - $80 Flower Cubes Bright sunny flower cube arrangements, or fresh flower cubes in pastel colors, whatever color you choose you can be guaranteed of a stunning arrangement in vibrant glass cube vases . Our vases come in a range of luminous colors which compliment our innovative floral designs. 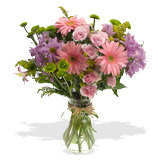 Send the highest quality fresh flowers available from the No. 1 online florist shop. If you are unsure of what colors you would like for your fresh flower cubes, have a browse through our site and read about the meaning of the different flower colors and this might help you when making your decision!